In I976 when there was very little to smile about that Christmas, one man’s proclamation of faith and of the gospel, commenced a ‘Sit Out’ for charities which in the ensuing decades was to make him a household name. Dean Sammy Crooks, or the ‘Black Santa’ as he became known and loved, lived by his faith, and in the faith of the generosity of the Belfast people. 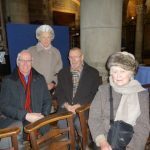 As Dean of St. Anne’s Cathedral, he dressed in his long back Canterbury cloak and balaclava helmet to ward off the cold, and could be found sitting outside the Cathedral with his barrel for the monies he would collect. As the years rolled on, so did the amount collected for local charities increase. Before retiring as Dean, on Christmas Eve I984, Dean Crooks completed his last ‘Sit-Out’, collecting more than £11,000 on that day alone, to complete a final total of over £53,000. A long way from the I976 figure of £784. 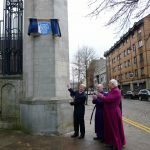 So it was most appropriate to the memory of the man who was also called ‘Dean Sammy’ and the ‘People’s Dean’, that an Ulster History blue plaque would be unveiled on the day on which the Very Rev. John Mann, the Dean of Belfast, would launch the 20I4 Christmas ‘Sit-out’. 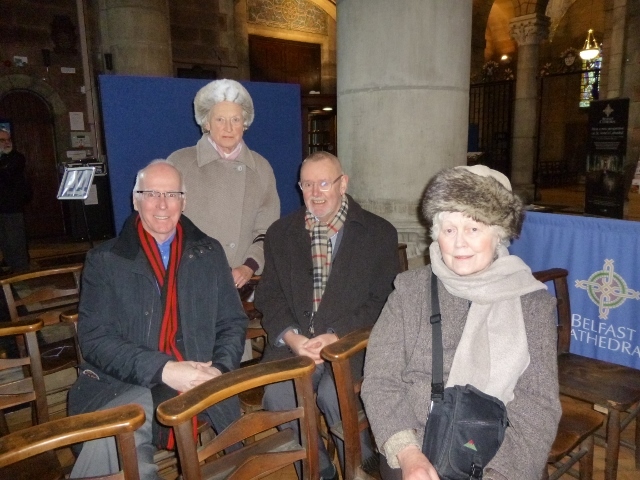 A large number of guests gathered inside the Cathedral to hear Chris Spurr, the Chairman of the Ulster History Circle, welcome guests and friends. (The Circle’s Hon. Secretary, Alan Boyd, had proposed the plaque. 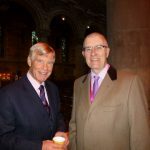 He was a former chorister at the Cathedral, had a 50 year association with the magnificent Church). All present listened intently to the speeches given by Lord Eames, former Archbishop of Armagh and a close friend of Dean Crooks, and to the Dean of Belfast, the Very Rev. John Mann. 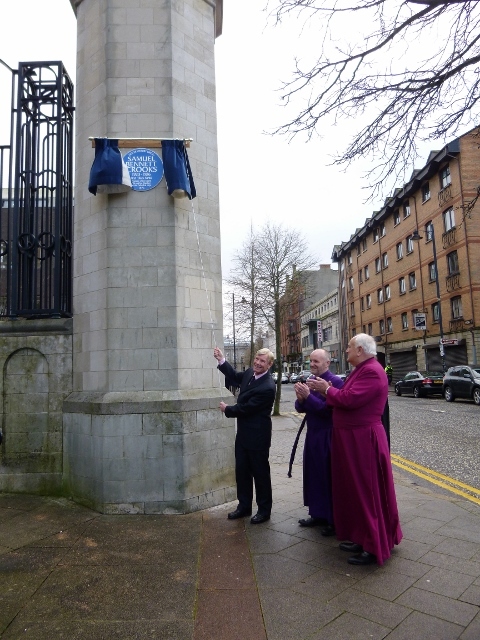 Before going outside to unveil the blue plaque, Dean Crooks’ son, Sam who had travelled from England for the ceremony, thanked the Ulster History Circle, the Cathedral Board, and all those who had made the commemoration possible. Sam said that his father would have welcomed the continuation of the ‘Sit-Out’ and that he had loved the Cathedral. ‘I see the plaque not only as a tribute to my father, but also to the generosity of the people. 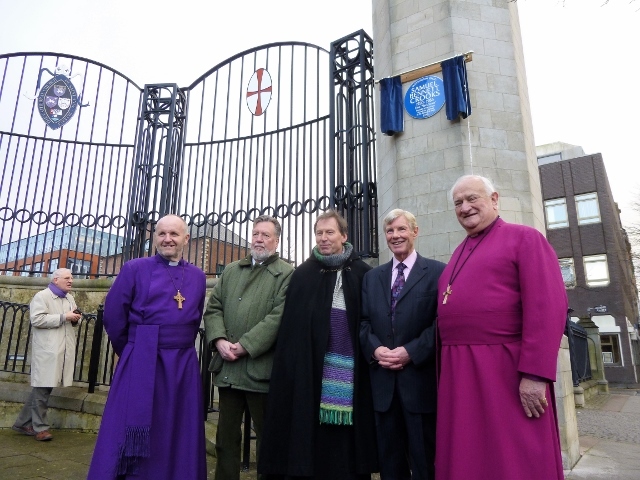 I believe the plaque will be a tribute to the continuing work of this great Cathedral, and a tribute also to that great man who started it all 38 years ago’, he concluded. 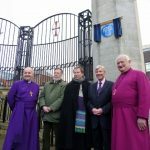 Following the unveiling, guests adjourned inside for refreshments, whilst Dean Mann wheeled his barrel to the Cathedral steps to commence the 20I4 Christmas ‘Sit-Out’. As with all the Deans since Dean Sammy Crooks, he was dressed in the long black cloak and woolly helmet, thus maintaining the tradition of the ‘Black Santa’. 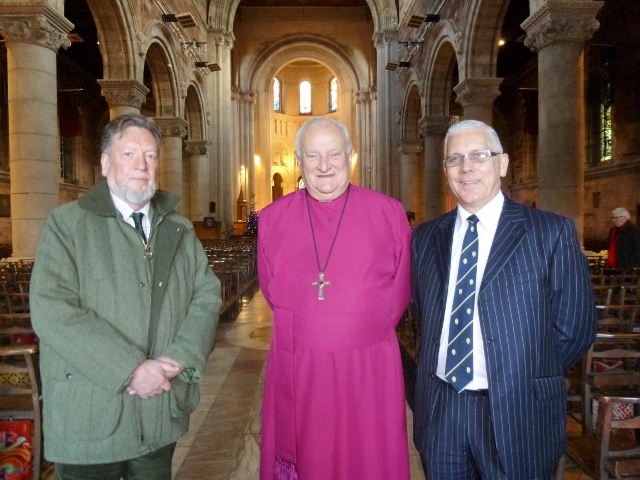 L-R. Chris Spurr, Chairman, Ulster History Circle, Lord Eames, former Archbishop of Armagh and Alan Boyd, Hon. Secretary, Ulster History Circle. L-R. Cyril King, Elsie Watson, Geoffrey Blower and Heather Grindle. Sam Crooks, son of Dean Crooks and Clive Scoular. Sam Crooks unveils the Blue Plaque to his father, Dean Crooks, the first Black Santa. L-R. The Rt. Rev. 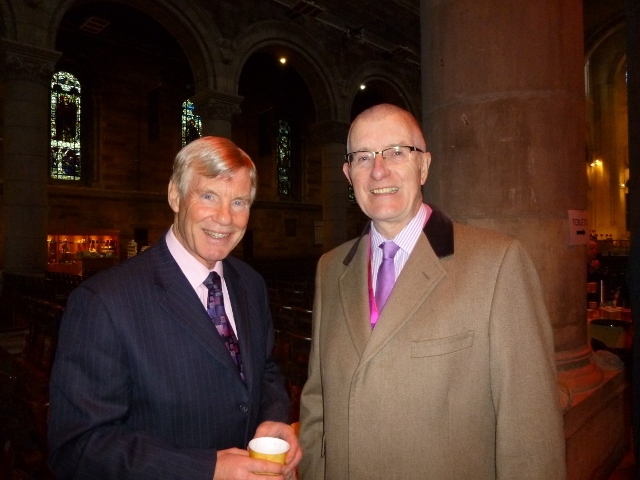 Alan Abernethy, Bishop of Connor, Chris Spurr, Chairman, Ulster History Circle, the Very Rev. 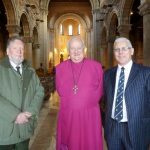 John Mann, Dean of Belfast and current Black Santa, Sam Crooks, son of Dean Crooks, and Lord Eames, former Archbishop of Armagh.